I know everyone back home is dying to know how my first day of class went. Let me just say that coming from someone who has taught high school students in Tennessee, it was awesome. The students here are so disciplined and well behaved that it amazed me. Part of the Chinese culture is to not stand out as an individual and pull away from the group so it was difficult if not impossible to get students to raise their hands. That being said they were super respectful and quiet during the lesson. I began by going over the rules for my classroom. 1.NO talking while I or another student is talking. 2.NO inappropriate cell phone use in class. (only dictionary). 4.YES to attending all classes on time and prepared. 5.YES all questions must be answered in English. 6.YES to speaking English even if you make mistakes. This class is for learning, there are no wrong answers. The students then got to learn about me, Miss Steiner and I gave a lengthy lecture on myself, my family and how great Louisville KY is. I told them we are going to have a derby party in May and they are going to have to wear big hats. The hardest thing is talking super slow. I only have one speed of speaking English and at a conversational level it is hard for them to understand so I had to slow down the speed at which I talk. On the plus side that means I can prepare less material for them. I am really nervous about this because it is getting me out of my comfort zone but my 4th period class was so great (and the smallest class of the day) so I invited them over for a game night at my apartment. I am blessed to have an apartment that is enough for me and to share, and I feel that I am not using my gifts correctly to keep it all to myself. Also I figure that if I don’t start getting traffic to my apartment early in the semester I never will have the courage to do it. So – the bottom line is this, if you have any suggestions for my game night on Saturday please let me know. I thought about having them come up with questions for Charades or play Spoons or Balderdash but I haven’t settled on one game yet. There were only 15 or so students that signed up this time so it should be a fairly small group. I’m excited! My class sizes range anywhere from 29-54 students with the average being in the mid 30’s. I am giving the students assigned seats so I can keep track of attendance and try to learn their English names. These are second year students so they have already picked an English name last year in their classes which is good because there is no way I could remember their chinese names or student ID numbers. The students thought it was very funny when I told them that Freed Hardeman University has 2,000 students. Zhongnan U has 32,000 students and around 2,000 teachers. Um, yeah, it’s a tad bit bigger. I’m already sick of Chinese food. The spices are not good, I don’t like the vinegar taste that so many of the vegetable dishes have and everything is really spicy for me. I’m hoping that I get adjusted to it which I’m sure I will but for today I settled on an egg salad sandwich for lunch with “American Original Flavor” potato chips. 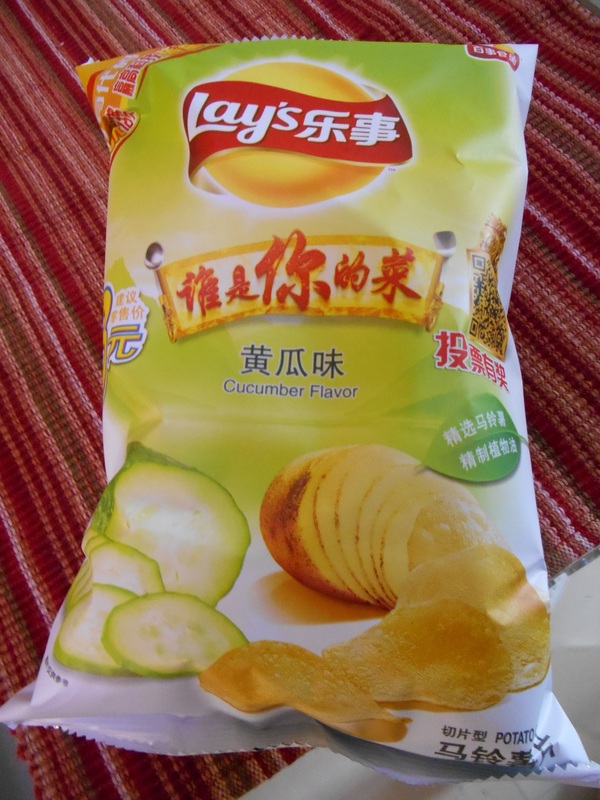 There are some really odd flavors of Lays potato chips like this one “Cucumber Flavor”. Only in China does even the junk food taste like vegetables. I did find a restaurant on Sunday with Mary and Edwin called Cat’s Eye Pizza. I have later found out that they deliver, yum. 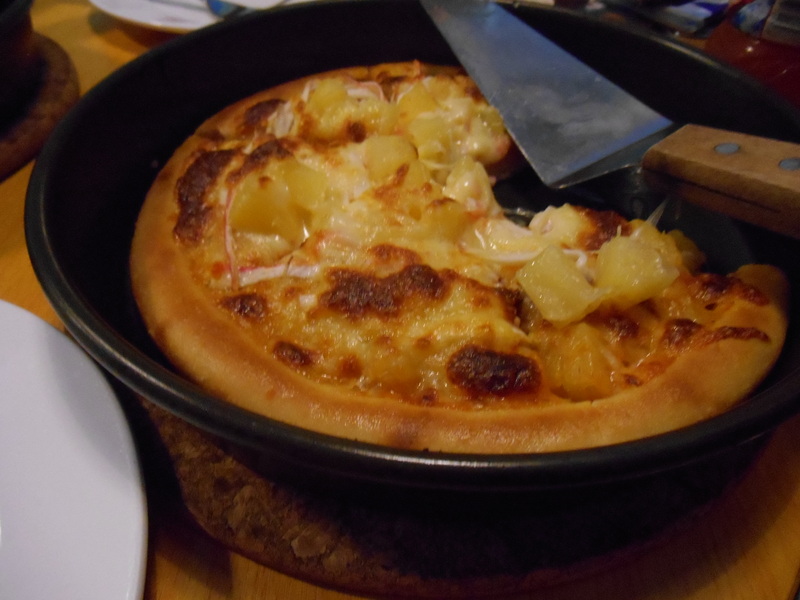 This is my Pineapple Crab Pizza. It was delicious but I can’t eat American food everyday, it gets expensive. The pizza was 24 yuen whereas street food is around 6-10 yuen. Yesterday for lunch I had a pita thing with sweet potato fries from a street vendor and a lemon water, all were delicious. I think perhaps it’s a bad thing that I’m finding all the deliciously deep fried dishes in China rather than eating a balanced diet of fruits, vegetables and rice like the Chinese do. I’ve also figured out why all the girls here are super skinny. Most of them only eat 1-2 meals a day containing mostly vegetable dishes with very little meat for flavoring. They walk everywhere, probably 3-4 miles a day at the minimum. One of the questions that was asked to me in class yesterday was “You seem very happy. Most American girls that have a little fat on them are not so happy?” Thank you very much, I can take a hint. I am going to start trying to live more like the Chinese and less like an American and perhaps I will start to look and feel more like the Chinese. I have started walking everywhere, which is hard. My feet hurt by the end of the day and my legs are a bit sore but I don’t need to get in the habit of taking a taxi everywhere and besides I can’t communicate enough yet to give adequate directions anyway. It takes about 30 minutes walking to get to classes in the morning, which is only on Monday and Wednesday’s. Walmart is a 40-45 minute walk so usually I will probably be able to walk there and then get a taxi home with my bags. I’ll get used to it, after all I need the exercise. So good to hear from you, Chrissi. This is all very interesting and helps me to understand the culture. The culture is definitely very different. It’s not better or worse it is just different. There are different philosophies of learning and such. It’s going to be a good year, I have a feeling it’s going to be my students that keep me going this year. After all they are a long way from home too. That’s awesome that they are so disciplined and well behaved! It really is. I have some exceptional students. We had just a little rain today. I have been wearing a pair of ballerina flats to walk around in but they are just canvas and may wear out fairly quickly. I’ve been taking my quiet time around 6am my time, but will try to start doing it at night too. Classes are going well and I only have to prepare one lesson each week that I teach to each of the 8 classes I have. So good to hear of your activities. Happy to hear you are having an activity night at your home. Quiddler is a good card game. Learn how to make words. Great to hear from you! I don’t have many word games. I do have Scrabble but that’s only a 4 player game. I thought about playing Charades with them and they have to guess the word in English or perhaps Balderdash (only I don’t have the cards to play it). I’m sure it will be great. My students are an absolute joy, they are so disiplined and well behaved compared to American students of the same age. I had a class yesterday of 54 students and they were all completely quiet and respectful while others were talking. I’m looking forward to the school year. I have no idea what my next lesson is going to be on though. I’ve been reading through their questions to come up with lesson ideas based on their interests. They want to know about American food, marriage and family life, hobbies and freetime, movies and TV, jobs in the US etc.